You are browsing: All Work, Vacation and Well-being: Who's afraid to take a break? Based on a twenty-year research study, Work, Vacation and Well-being delves into the ubiquitous yet often-underestimated issues surrounding vacation and respite. Providing an original outlook on how breaks from work can be beneficial for the well-being of employees, this book also addresses the potential negative impacts of vacation. Taking into account factors concerning the nature of the break and the person taking it, Etzion delves into the benefits and drawbacks of workplace breaks, from annual leave to maternity leave and sabbaticals. 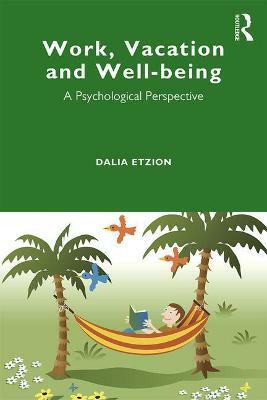 Work, Vacation and Well-being looks at breaks from work through various social and cultural lenses, to present a balanced and well-researched perspective on all angles of taking a break. Perfect for students of Organizational and Health Psychology, Work, Vacation and Well-being also widely appeals to those studying Social Policy, Management Studies, Occupational Health and Research Methods. Dalia Etzion is an Emerita Associate Professor of Organisational Behaviour at Tel Aviv University, Israel, and has held visiting-scholar appointments at various US universities, including MIT, UCLA and UC Berkeley. She is a certified Industrial/Organisational Psychologist and holds membership with SIOP, APA, STAR and the Academy of Management. Her current job interests include: job stress and burnout; crossover of strain between life-partners; and the impact of vacation and respite on well-being.